Phil Ivey, one of the world’s most popular and successful poker players, put his name in the online poker history books by winning his tenth WSOP title at the 2014 WSOP $1500 Eight-Game Mix tournament. 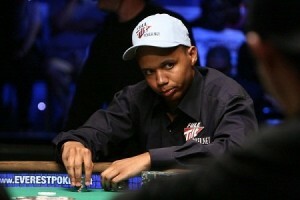 38 year old Phil Ivey won his tenth WSOP bracelet making him the youngest player ever to do so. Ivey is following in the footsteps of poker legends such as Johnny Moss, Doyle Brunson, Phil Hellmuth and Johnny Chan. Ivey’s results are even more impressive as he is only 38 years old, making him the youngest ever player to hold ten WSOP bracelets. Ivey’s record is followed closely by Hellmuth who was 42 when he won his tenth bracelet while Chan and Brunson were 48 and 71 respectively. Ivey’s victory comes amidst allegations of cheating in connection to his $9.6 million win at baccarat at Borgata casino in Atlantic City. The casino took Ivey to court as they believe that he worked together with his friend and used a defect in the cards to cheat his way to the impressive win. Ivey is denying all allegations and stated that he managed to win only due to his exceptional skills. Ivey’s lawyer made an official announcement claiming his innocence: “Each and every penny of the defendants’ winnings was the result of sheer skill”.